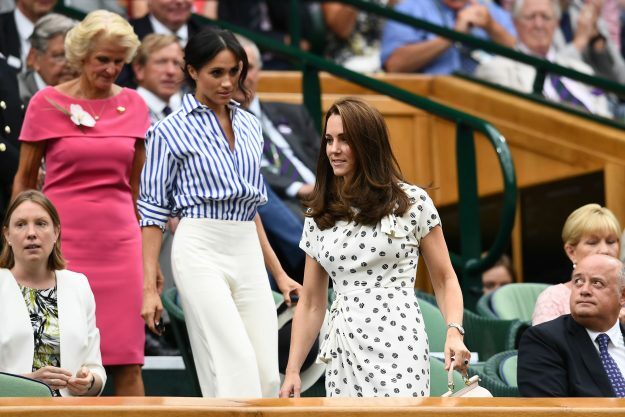 Meghan Markle, the Duchess of Sussex, joined Kate Middleton to watch Wimbledon on 14 July. 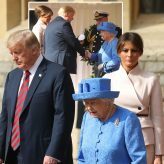 While Kate looked elegant in a patterned polkadot dress, Prince Harry’s wife shunned the dresses and skirts she’s been wearing of late for a pair of Ralph Lauren trousers. 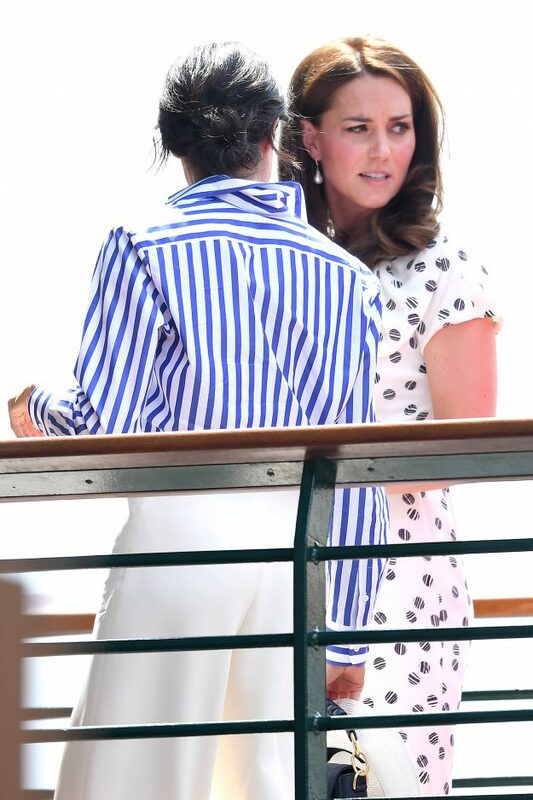 Meghan paired her wide-leg white trousers with a stylish blue striped shirt also by Ralph Lauren, referring to her old style of hair by tying her tresses into a messy bun. 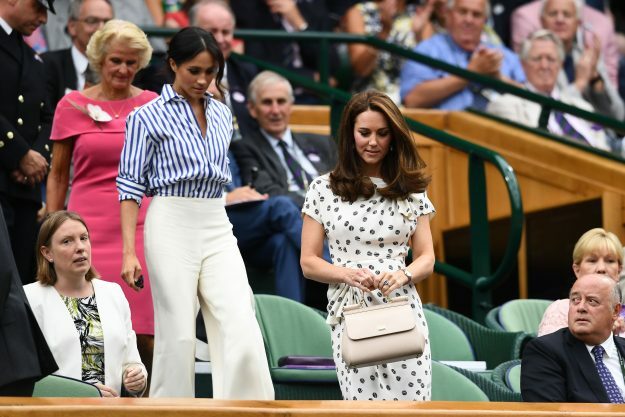 The Duchess of Sussex’s outfit was vastly different to sister-in-law Kate, who never fails to wear a dress while in the Royal Box at Wimbledon. 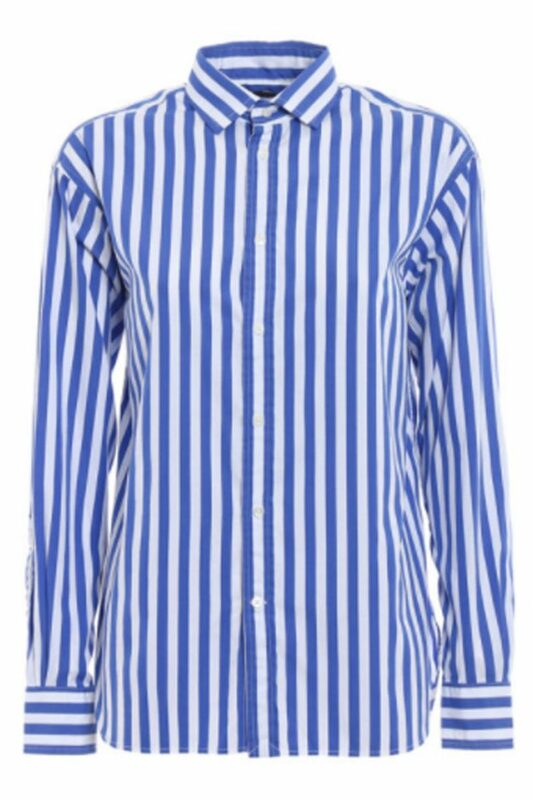 Meghan’s striped shirt is be a Ralph Lauren piece worth a whopping £128. Her outfit choice is said to be a nod to the designer, as Ralph Lauren supply the clothing for the Championship’s ball boys and girls, lines judges, and umpires. Many fans were quick to comment on Twitter how the 36 year old looked identical to the line judge. She wore the satin cotton shirt tucked into her smart white trousers, effortlessly pulling the top from her waistband to create a flattering silhouette. 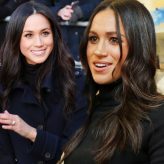 The trousers graced over Meghan’s feet, showing off her long slender legs. She had a panama hat in hand as she greeted event organisers, despite fashion rules in the Royal Box stating spectators mustn’t wear a hat. Meghan has attended Wimbledon in the past, to support close friend Serena Williams. 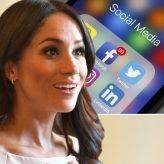 However, this time around will be a very different experience for the new royal.